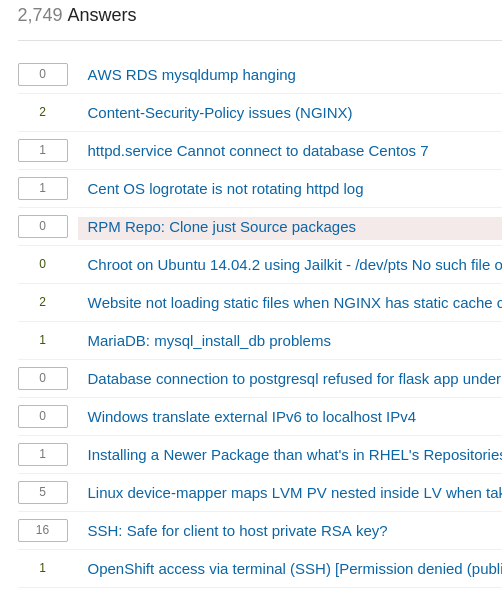 I want to give you a heads up that I'll be making some minor design updates to SF site design to reflect recent changes on Stack Overflow and Super User. Visually it should "feel" the same as the old site with slight layout adjustments. The new icons and site logo will be in svg for retina support too. This update should retro-actively fix most of the old design bugs. If you see any new ones, or old ones not yet fixed, please post an answer here to let us know! ETA for new design launch will be this evening EDT. Edit: we have just launched the new design update. It is now live. Gray fonts, bleached colors, buttons that can be lost to sunglare. Not fun, and certainly not easy to read. I feel that the fairly big jump in colors, towards a color scheme with markedly less contrast is less comfortable compared to the old design. I'm primarily referring to the blue links which have now become a much lighter blue nuance. I would say that what is currently the 'visited' color would be much better as the main color for links, while I think the current 'hover' color is outright too light to go with a white background. For the sake of people who primarily answer questions and spend time on pages with listings of questions (where the bulk of the page contents is link text), I think it would be better to go with a more utilitarian approach over what I presume is purely a design decision. 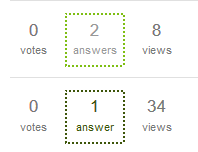 Accepted answers do not have an outline, or a different color, while non accepted answers have a box around the number of votes. Notice that the ones with a box were not accepted, and the ones without a box are accepted. This is confusing, to say the least. The new layout has a bug in the "tab bar" on Firefox 36/Mac. Note the small bumps in the horizontal line. They don't appear on Safari or Chrome. I just noticed the effect can also appear when zooming on Safari and Chrome. There are some strange color choices for the moderator links in a user's profile. WAH, the profile page can't haz any background color for accepts, accepted answers, the upvotes are black, where did I just get? It looks like you missed one of our outstanding design issues. 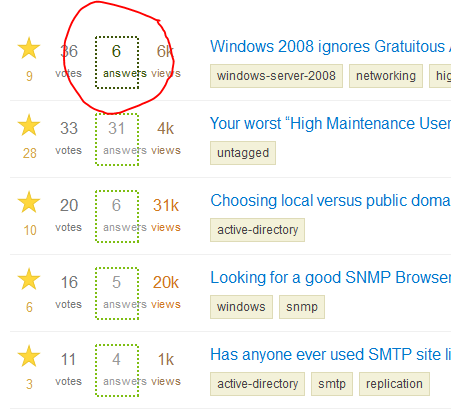 The yellow on white in the /questions list for questions with accepted answers is hard on the eyes. The dots are wrong, the double dots are fugly. It's the same on the main SF site too. I checked on [SU] and [SO], they don't have nasty looking double dotted boxes. I'd like to reiterate what @Hakan already said - the new colours are less readable by several degrees, I have to strain to read the screen, when before, I could cross read the entire set of questions in a second. Please make the light blue darker again. First of all, let me tell you that i absolutely love the new design. It's soooo cool, looks very clean and appealing to me! What has always confused me, but still is very confusing and also very badly visible are the dotted borders around the Answers. The light green boder-color is hardly distinguishable from the black border-color. I would propose the answered questions get a solid border, a light background, anything that makes them distinguishable. When hovering over the black-dotted box, a label appears "one of the answers was accepted …". When hovering over the green-dotted box, no label appears. It would be helpful to have that label with an explanation what the green-dotted means. 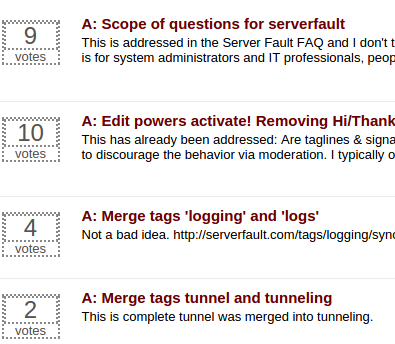 Unrelated to the dotted boxes, but related to the missing explanation: What are those light yellow tinted questions? (answered) Maybe the layout could be enhanced to give an explanation anywhere?